It is a bit unclear how Mother Goose got her start, but she was well-known by the mid-17th century as a mythical storyteller. Charles Perrault was the first to add her name to a collection of stories in 1695 when he gave his book of fairy tales the subtitle Tales of My Mother Goose. His book contained such classics as Cinderella, Little Red Riding Hood, and Sleeping Beauty, and was translated into English in 1729. Short rhymes were added to the collection by 1781, which are still loved and recited by children today. May 1st is National Mother Goose Day. It was first celebrated in 1987 as a day to honor these beloved nursery rhymes and stories. Use this as an opportunity to add some fun Mother Goose activities to your homeschool day! Sneak a few of these activities into your regular schedule, or spend the entire day celebrating Mother Goose. Read The Real Mother Goose online for free. Watch Disney’s The Truth About Mother Goose to learn the origins of some of the rhymes. Use these Nursery Rhyme Activity Packs for handwriting practice. Play a round of Nursery Rhyme Jeopardy. Put together a Nursery Rhyme Lapbook. Print some Mother Goose Coloring Pages. Read some Nursery Rhyme Mini Books. Get creative with a few of these Nursery Rhyme Crafts. Compete in the Nursery Rhyme Olympics. It totally counts as PE. These nursery rhyme foods would be fun in a themed lunch, packed in a picnic basket, or served at a tea party. If you would like to spend more than a day on this topic, you can easily put together a Mother Goose unit study. Simply choose your nursery rhymes and select some activities to go with them. You can even turn nursery rhymes into a year-long preschool curriculum. 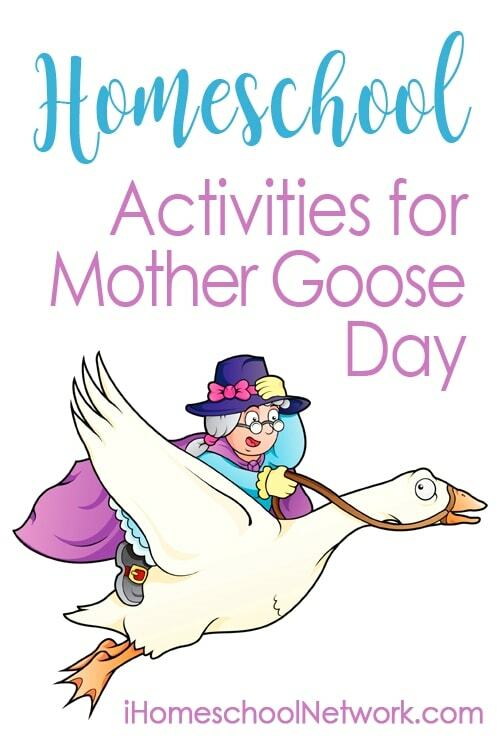 Have fun using these homeschool activities to celebrate Mother Goose Day!